Welcome to the start of the blog tour! I'm working with Hachette NZ today to bring you the first post in their week of posts for the Karen Rose Blog Tour. Get comfy and I hope you enjoy the week, I'm certainly excited for it! 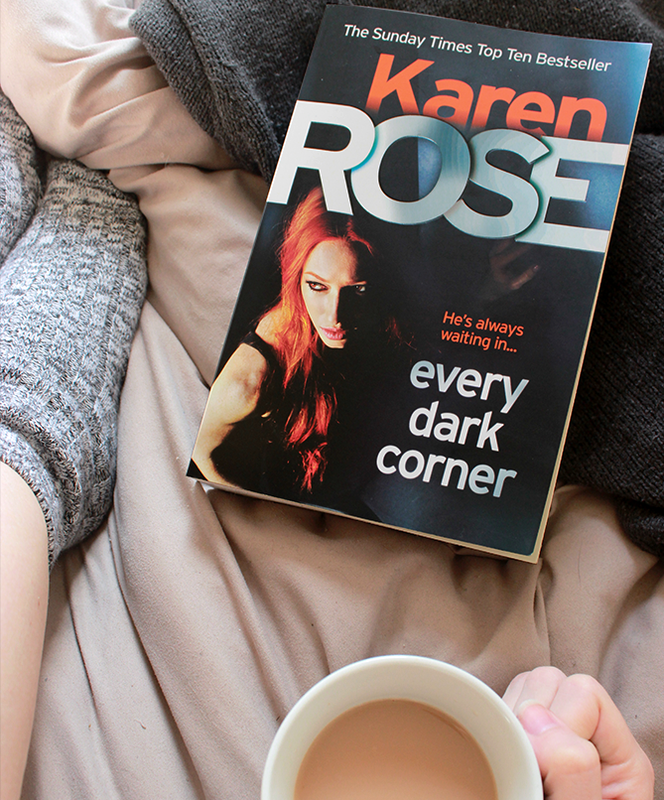 So today I'm bringing you a review of Karen Rose's latest mahoosive book Every Dark Corner*. I was a wee bit sceptical about this as I'm not really a huge fan of books that aren't young adult, romance or fantasy. But after reading the first chapter and realising I was pretty much reading a really long episode of Criminal Minds my scepticism faded and I almost haven't put it down since. Well, until I finished it that is. Now when I signed up to be a part of all this Every Dark Corner business I didn't realise what I was getting into. I'd briefly read the blurb yes but little did I know I would be spending the next few days of my life reading about child pornographers. Before you click off, it's about the FBI catching the child pornographers so it's not as bad as it sounds, but I definitely wasn't expecting this. Turns out this is also third in a series but trust me when I say you don't have to read the first two to totally understand what's going on, it's up to you whether you do or not. To my surprise I really enjoyed this book. I was able to connect to the main characters so much that I did not want to put this book down, I just needed to know what happened next. The whole book took place over the course of around 3-4 days, although it didn't feel like it. Every hour felt like a day until they mentioned a scene that happened chapters and chapters ago was only recent. Mostly every character in this book seems to be related; either by blood or friendship. Seriously, a new character is introduced and she turns out to be sister to one person, best friend to three others, and a friend to someone else's sister. So obviously when one person get's hurt they're all affected. The point of view goes through most of the characters, allowing the story to be told in a way that would be impossible through one person's point of view, especially as we get to see the story through the criminals eyes as well. There are a lot of twists and turns in the book, while obvious things happen like romance and justice most of the time you can't guess what's going to happen next. One minute they have a lead and the next someone's getting stabbed. The story keeps you on the edge of your seat I'll tell you that! I totally recommend giving this book a shot, I wasn't sure if I'd like it and it's probably one of my top books of this year I enjoyed it that much. I'm totally going to start reading some more thrillers now, although this is not fully converting me and stopping me getting my cheesy romance fix! *This post is in collaboration with HachetteNZ, I was gifted the book however all opinions are my own.